Traditional style ceiling fixture with a domed, etched glass diffuser. Decorative ceiling pan transitions nicely to glass shade which is held in place with a matching metal finial. Safety listed for use in damp locations such as bathrooms. The design delivers great versatility with installation options that include both a pendant and a close-to-ceiling configuration with included hardware. Glimmer fits the definition of liveable luxury with elements that sparkle to create an instant statement within the home. Prismatic glass three-light pendants are supported by an architecturally- styled frame in Antique Bronze finish. The cascade of faceted linear glass deliver a sleek silhouette to any room. 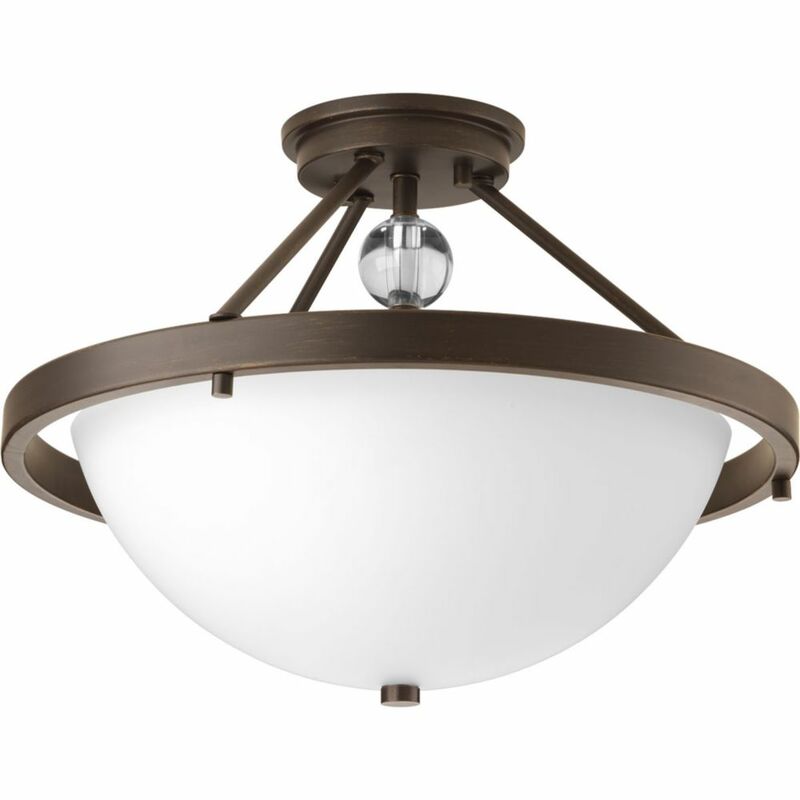 This versatile fixture can also be mounted as a semi-flush. The Kensington Collection is a wonderful blend of casual and traditional elements. Swirled caramel finish glass shades are set atop a skilfully scrolled bronzed frame. These rich details come together to create a rich focal point for any room in your home. The design delivers great versatility with installation options that include both a pendant and a close-to-ceiling configuration with included hardware. Compass Collection 2-Light Antique Bronze Semi-Flushmount Find your frame of reference with the Compass collection. Distinguished by crisp, linear elements that both contrast and cradle opal glass shades for pleasing illumination. Whether your style is modern or you simply prefer a style that is elegantly simple, Compass provides a sophisticated accent to your home's decor.